This level has medium difficulty. For this level try to play near to blockers or make special candy by combining more same color candies. Try to play more from bottom to shuffle the candies as it will help to get more special candy. Combine them with each other to break more blockers or play near to blockers to break the snow blockers to find the bears. Why does it say in 35 moves when my board is only showing 30 moves? My board only shows 30 moves too – what’s up with that?! Mine also… Only 30 moves, what’s up with that??? I only have 30 moves! And of course anyone could pass with the combinations you seem to have been lucky enough to create. Need a lot of COLOR BOMBS with FISH or SPECIAL candies LIKE you show in your VIDEO NOTHING shows up like your video NO COLOR BOMBS OR ANY COMBINATIONS AT ALL takes all my moves to CLEAR the FIRST LINE of BLOCKERS NEED my 35 moves on this level TOO. NEED A LOT OF COLOR BOMBS WITH FISH OR SPECIAL CANDIES. 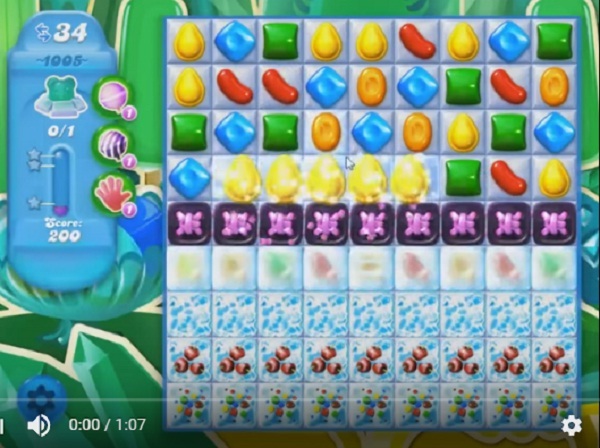 IMPOSSIBLE TO GET COMBINATION CANDIES YOUR VIDEO DOESN’T HELP AT ALL. One more thing… I have only 30 moves myself but if you watch the video you’ll see that it was cleared in less than 30 moves. Candy crush Mom are you kidding medium difficulty! I too only have 30 moves & the level is labeled very hard by King! I never get anywhere near getting a rainbow Kimmie & this is definitely what’s needed to clear this level. Either that or a lucky board. Haven’t succeeded yet!